— Days of escalating government protests failed to halt the Bahrain Grand Prix on Sunday, which took place even as nearby streets were blocked with burning tires and trash. Opposition calls for large protests had raised fears the Grand Prix would have to be canceled for a second year in a row and pose a threat to Formula One crews, workers, and fans. There were no major signs of protest at the race itself. Red Bull’s Sebastian Vettel secured the win, followed by Kimi Raikkonen and Romain Grosjean of Lotus-Renault. Activists said police arrested a group of at least seven female protesters inside the circuit who held up a signs demanding the release of Abdulhadi al-Khawaja, a member of the opposition who has been on a hunger strike for more than two months. A government spokesman said he could not confirm those reports. Sunday’s race was a “huge success,” he said. A short time later, Miller sent a message himself on Twitter declaring he’d “been released with my crew. Breakneck drive to Bahrain airport in police van. Being deported now.” The foreign affairs correspondent wrote that police “refused to give us back our cameras and computers,” and that his driver and an activist accompanying them were still in custody. “We are assured they will be freed soon,” Miller said. Anti-government protesters had called the race a publicity stunt by the country’s rulers to make the nation appear more unified. The Bahrain Grand Prix was canceled twice last year amid an uprising sparked by the success of popular revolutions in Egypt and Tunisia. Bahrain’s Sunni-ruled government brutally crushed the Shiite uprising, though the opposition has continued to demand political reform in protests and, occasionally, clashes with authorities. The February 14 Youth Coalition, an opposition group that took its name from the day the Bahrain uprising began last year, had urged protesters to turn out during the race Sunday. “We ask the rebels in the western villages to escalate the revolutionary mobilization to the highest levels and to continue to target the street leading to the Bahrain circuit,” the group said on its Facebook page. 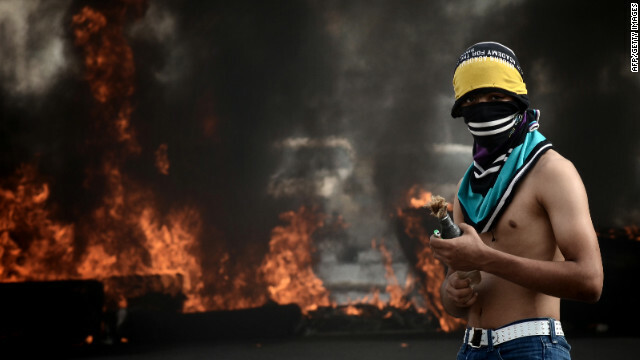 Protests with burning tires and trash blocked most of the secondary roads leading to the race track, though the main highway remained open, said Mohammed al Maskati of the Bahrain Youth Society for Human Rights. There were also protests in many nearby villages, he said. Bahrain Crown Prince Salman bin Hamad Al-Khalifa had said another race cancellation would play into extremists’ hands, according to the state-run Bahrain News Agency. And the sport’s governing body vowed the event would go on, despite continuing high tensions. On the eve of the race, security forces in a suburb of Manama clashed with thousands of protesters who were attempting to march to the highway that leads to the Formula One circuit. At least three people were injured during clashes, al Maskati said. The demonstration was in response to the death of a protester whose body was found early Saturday on a farm outside Manama, a day after he took part in a demonstration that was broken up by security forces, according to opposition groups. Bahrain’s leading opposition party Al-Wefaq and the Bahrain Youth Society identified the man as Salah Abbas Habib Musa. The Bahrain Interior Ministry confirmed the identity of the 36-year-old man, and said the case is under investigation. Formula One is the world’s most popular motor sport, and races have a TV audience of more than 500 million. Canceling the race last year cost Bahrain an estimated $480 to $800 million in potential investments. The Bahraini government has played down any risk to visitors, saying the Grand Prix will act as a unifying force amid the nation’s civil unrest. Bahrain has declined to extend the visas of non-sports reporting crews from CNN, Reuters and other news outlets and told them they would not be allowed to stay for the race. Protesters, meanwhile, are using the international spotlight on the Grand Prix to call for the release of al-Khawaja, who was arrested about a year ago. Al-Khawaja is protesting the life sentence he received for his role in anti-government demonstrations. Denmark’s ambassador met Sunday with al-Khawaja, who once lived in the country and holds Danish citizenship. The Danish government has asked that Bahrain turn him over; Bahraini officials have refused. He was in stable condition Sunday, the Bahraini government spokesman said. Al-Khawaja can appeal his life sentence during a hearing Monday, the government has said.